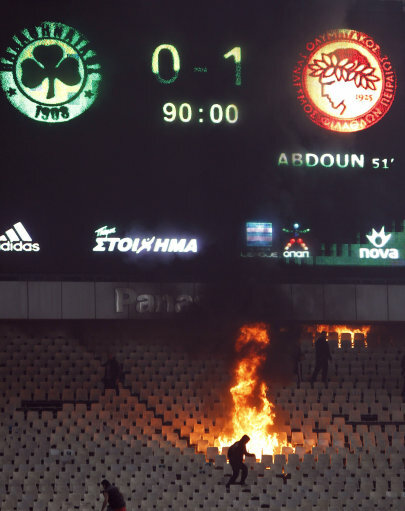 Now, we’re not exactly economic experts here on Pies but we can say with a fair bit of confidence that ‘things ain’t great’ over in Greece at the moment what with the entire country being brassic and all – and the coffers at Panathinaikos are no different. Yesterday, the company which oversee Pana’s renting of their Olympic Stadium from the state threatened to quite literally turn out the lights if the Athens-based club don’t pay up at some point in the near future. Stadium president Petros Galaktopoulos sent an open letter to the club, the Greek Super League, the Greek Football Federation and to cable television channel Nova requesting that penniless Panathinaikos stop playing night matches in order to save on the team’s mounting unpaid electricity bills. “Due to financial difficulties, Panathinaikos has not met the minimum financial obligations towards the stadium. Panathinaikos have also announced that the club will be downsizing from the 70,000-seater Olympic Stadium which they moved to in 2008 and slouching back to their former home at the 29,000-capacity Apostolos Nikolaidis Stadium in order to reduce their monthly outgoings. panathinaikos has a very big name in europe but also serious financial problems the last 2 years.. the only chance to take some more money this season is to win tottenham hotspur in london next week and to continue in e..league ..i think this is very difficult almost impossible…….etc… apostolos nikolaidis stadium capacity is 16000 only ( allseater) and no 29000!!!!) its a stadium of the past with nothig modern on it and dangerous for the safefty of the players if the supporters are aggresive!!!!! !